This reissue of Menand's classic intellectual history of T.S. Eliot and the singular role he played in the rise of literary modernism features an updated Afterword by the author, as well as a detailed critical appraisal of the progression of Eliot's career as a poet and critic. 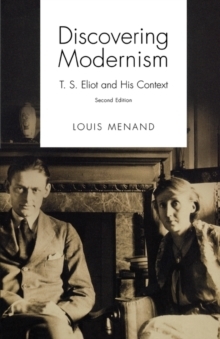 Menand shows how Eliot's early views on literary value and authenticity-and his later repudiation of those views-reflect the profound changes regarding the understanding of literature andits significance that occurred in the early part of the twentieth century. The new Afterword was adapted from Menand's critically lauded essay on Eliot in The Cambridge History of Literary Criticism, Volume Seven: Modernism and the New Criticism.